Disney, widescreen 2.35:1, languages: English DD 5.1 [CC], subtitles: none, single side-single layer, 16 chapters, rated R, 94 min., $29.98, street date 9/7/99. Directed by Kevin Spacey. Starring Matt Dillon, Faye Dunaway, Gary Sinise, William Fichtner, Viggo Mortensen, Joe Mantegna. When there is no easy way out, what do you do? Whom do you trust? Those are some of the many questions at the center of this plot of a trio of mixed-up criminals on the run from a robbery gone awry. Matt Dillon, Gary Sinise, and William Fichtner speed through a federal stake-out, crash their getaway car, get mistaken for gun runners and unwittingly take a group of patrons in a small Southern bar hostage. This draws SWAT teams, the media, and a determined ATF agent Joe Mantegna into a world gone wrong, where nothing is as it seems. As the clock ticks down, violence seems inevitable. Academy-Award winner Faye Dunaway and Viggo Mortensen play the captives in this cat-and-mouse ordeal that begins as a case of mistaken identities, and soon develops into a powerful drama about the cost of survival. Isn't anybody happy with their lot in life? I guess not, because even though some folks do spectacularly well in one field, they always seem to feel that they have to branch out into another in order to prove how "diverse" they are. In fact, I even heard about a school psychologist who writes DVD reviews for the internet! What a moron! 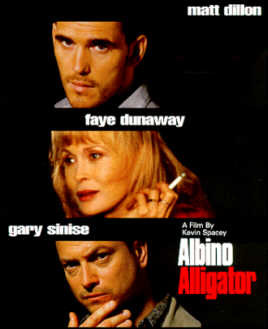 Add to the list of neo-renaissance men Kevin Spacey who went behind the camera to direct the character drama Albino Alligator back in 1996. Based on the evidence of his first directorial effort, I'd say Spacey did a decent job, but not one that makes me think he should give up his day job. My experience with AA was unusual because I watched the film without knowing much about it in advance. That's actually a pretty cool thing, in my book, because I usually know a lot about movies before I see them. I had an exceptionally vague notion about the storyline for AA and I knew who was in the cast, but that was about it. It turns out that I wasn't missing much. AA is clearly one of those "character pieces" that actors like so much. It's not a surprise that an actor directed the film; Spacey does everything he can to put his performers in the spotlight. That's not necessarily a bad thing, but it might have worked better if the film possessed more of a plot. As it stands, it seems that the piece exists mainly to give each of the actors occasional "star moments" where they get to prove their abilities. This tone gives AA a tone that makes it seem like an adaptation of a stage play. The way the whole thing goes, you'd swear it started life as a stage production, but that doesn't seem to be the case. This feeling occurred to me partly because of the limited number of settings - the vast majority of the film takes place in a bar - but also due to the enhanced emphasis on character interaction; the film downplayed action to the degree that it simply felt like something you'd see on stage. As I previously mentioned, the film's storyline is practically nonexistent. Three guys commit a crime, they hole up in a bar while they're on the lam, the cops trap them and they spend most of the movie trying to figure out how to extract themselves from their predicament. This is something we've seen a million times, and done better as well. The DVD case touts that the viewer should "expect unexpected twists and turns, all leading to an incredibly explosive climax!" I must have gotten an edited version, because those scenes were missing from my copy. I'm usually pretty dense about foreseeing plot twists, but I saw each and every one of AA's "surprises" coming from a mile away. And let's just say that the climax didn't exactly boil my potatoes. Focus on characters can be a good thing, but in Albino Alligator, it's all on the surface. We hear these characters talk a lot, but they don't really say much of anything. To be frank, I found each and every one of them to be completely forgettable; it's only been a few hours since I watched the movie, and I'm already having a hard time remembering any of their names! That's what they call a "bad sign..."
The acting itself is perfectly adequate. It's a good cast, but the poor script really lets them down. I suppose they did what they could with the material, but no one really does anything for me. In keeping with the fairly mediocre quality of Albino Alligator, the DVD release from Miramax offers nothing too exciting. The film itself is presented on one side of this single-layered DVD and it's shown in its original theatrical aspect ratio of 2.35:1. The image itself is generally pretty good, but it's fairly soft; close-ups look fine, but wider shots often seem a bit fuzzy. This is likely the result of all the interior lighting, which also gives the image a fairly brownish tone; the colors seem decent but tend toward "earth tones" in that way. Happily, I did not detect any signs of artifacts or grain; the picture looks very clean. Unfortunately, although it's perfectly watchable, it's not as good a picture as I'm used to seeing from Disney; while many denounce their general to release any 16X9 enhanced titles, I've found most of their DVDs to look very good, and Albino Alligator isn't quite up to the high quality I'd seen in many of their other DVDs. On a more positive note, AA boasts a surprisingly effective Dolby Digital 5.1 mix. I didn't expect much from such a small, character-driven drama, but the sound really makes great use of what it has. During the audio commentary, Spacey mentions how important he believes sound is, and his interest in that area really shows. The mix features a nice soundstage and strong separation between the front three channels, with occasional good use of the surrounds for effects. All five channels also always offered a strong reproduction of the excellent percussive score; the music greatly heightens the tension in the film (actually, it CREATES much of the tension, since the story didn't do it for me). Also, the quality of the audio is always terrific; dialogue, effects and music sound pure and natural. All in all, it's a top notch audio mix and one of the best I've heard for this kind of film. It's a sad commentary on the quality of the supplements for most Disney-distributed films to recognize that the scanty extras on Albino Alligator actually make it one of their more deluxe DVDs. Speaking of commentary, that's the most significant feature here: an audio commentary from Spacey and editor Jay Cassidy. Spacey does the vast majority of the talking, but Cassidy also provides some interesting tidbits. Overall, it's a useful and entertaining track. It's not as interesting and compelling as some, but the participants cover the film nicely and discuss various aspects of the movie such as casting, acting, and the technical nuts and bolts. I wasn't fascinated by the commentary, but it's definitely worth a listen. In addition to this commentary, we get a "behind the scenes" featurette that ALMOST runs for a whole two minutes! Whoopee! During this fascinating piece, we get to hear the actors tell us what a great director Spacey makes while we watch him do such directorial tasks as look into a camera lens and talk into a megaphone. Man, if Spacey himself had anything to do with the making of this piece, then my respect for the guy just dropped enormously; the whole thing looks fairly pathetic. All in all, I simply didn't think much of Albino Alligator. It's not something I think I would ever want to watch again, and it's not something that I much enjoyed the first time through. It's not a BAD film, but I found it to be very pedestrian and predictable. If you already know that you like the film, the DVD may be a good choice for you; I found the image to look a little soft, but not bad, and the excellent sound almost made up for the picture's faults. The DVD also offers a good audio commentary, though not much else. Unless you're a die-hard fan of one of the participants, I really can't recommend Albino Alligator. James Berardinelli's ReelViews--"A cagey, claustrophobic noir thriller highlighted by a few clever plot twists, some nicely-honed dialogue, and a half-dozen top-notch performances." Roger Ebert--"Spacey does what can be done with the material, but it never achieves takeoff velocity." Simply Spacey--The design of the site is superb featuring a terrific collection of articles, biography, credits, sight & sound, postcards and much more. Highly recommended!! Gary Sinise - Actor and Director--Categories on the latest news, stage & screen, biography, photos, fan club and more. Mr. Showbiz Celebrities--An excellent source for profile and credits on Faye Dunaway and Matt Dillon. Amazon.com--Purchase the DVD at special discount.